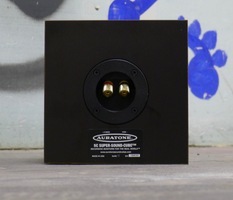 5C Super Sound Cube (2014), Passive Monitor from Auratone. For years, the tendency in recording studios was to always look for bigger, more powerful and more accurate speakers. The '70s and '80s, however, saw a new trend begin with more modest speakers becoming a must in every studio. The goal of these "grot boxes" was to provide a perception of sound closer to that of a regular listener. Because after all, the average Joe usually has a humble listening system which can only partially reproduce the frequency spectrum and dynamics of any music production. 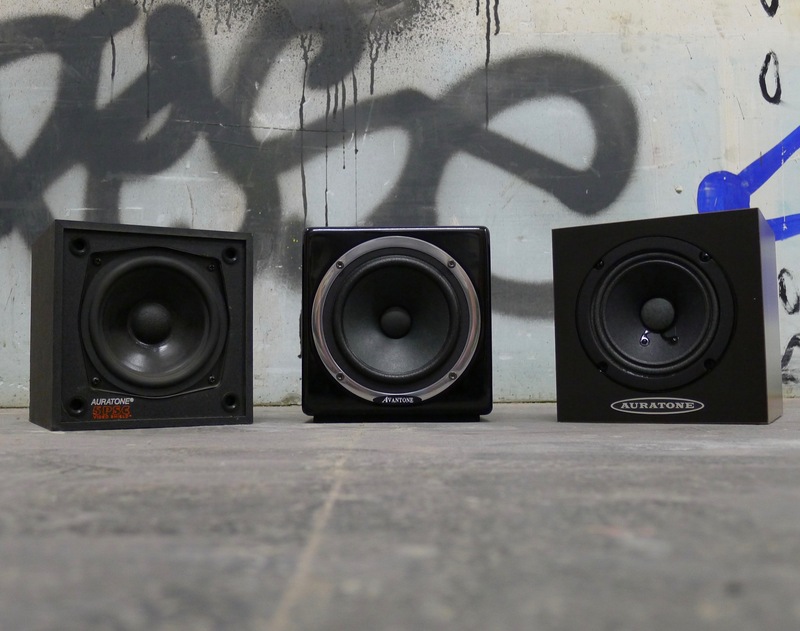 These small speakers allow the sound engineer to focus on the most important things and make sure that the mix "translates" correctly to any car stereo or budget home audio system. The most famous of such speakers are the 5Cs manufactured by Auratone, a company established in 1958 by Jack Wilson who actively marketed his famous speakers until he passed away at 84, in 2005. Fortunately, he didn't take his production secrets to the grave with him and his grandson Alex Jacobsen was able to carry on with his work when he took over the business. 2014 marked the return of the 5Cs, which are still 100% made in the United States. These small cubes are 6" 1/2 x 6 1/2" x 6" (16.5 x 16.5 x 15.2 cm) and feature mahogany veneer (and a sealed MDF cabinet) on all four sides, just like that old car your dad used to have and you loved so much. The single 4.5-inch driver sits at the center of the front panel of the passive speaker. This means you will need an external amp connected to the binding posts on the rear to drive them. 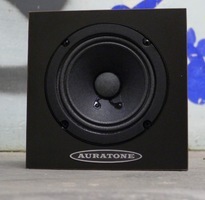 Auratone recommends a 25-Watt RMS/50-Watt Peak (into 8 Ohms) amp. The speakers are magnetically shielded, so you can take out again your old CRT monitors, tape machines and HDDs without any concerns. 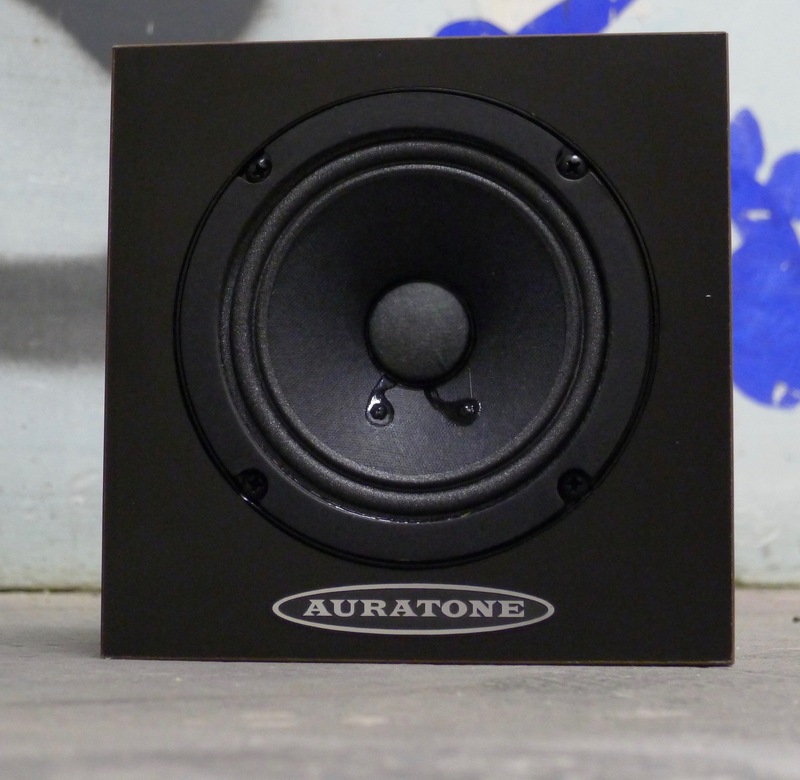 The 5Cs were not always exactly the same: those from the '70s were, generally speaking, a bit more brilliant than those from the '80s, so Auratone had to choose which way to go for the new 5Cs, which ended up being more like the '80s model, with a bit more high end and low end, according to the manufacturer. Since there's not much to add about these 2014 5Cs, we decided to compare them to two similar models: the Auratone "vintage" 5PSC passive speakers (a model which, surprisingly, Auratone doesn't carry anymore) and the MixCubes active speakers by Avantone (a company established in 2003 by Ken and Sue Avant). The passive speakers were driven with a Crown D-75A amp and we did all the tests (in mono) in the control room of U.F.O Studio in Paris, France, thanks to the hospitality of Alexandre Mazarguil. We started by taking measurements at the main listening point. The results are below: in red are the Avantones, in blue the Auratone 5PSC and in green the new Auratones. It's easy to tell from this that the new Auratones have a less developed low end than the two others, which is something you can also hear. 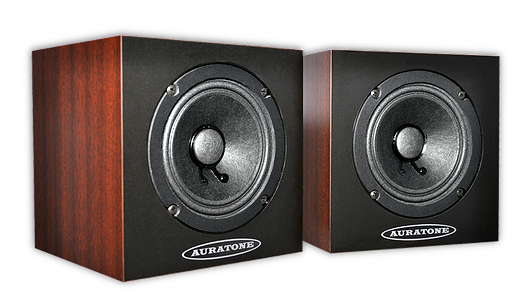 The Avantones have a much more irregular frequency curve than both Auratone models, which means they are less neutral and exhibit a more significant deviation, which can be a real handicap during mixdown or mastering. There's a big dip at 800Hz and two bumps at 1.5kHz and 2.5kHz. The dips and bumps beyond these frequencies are due to the room rather than the speakers themselves. When considering the high end, the 2015 Auratones seem to be better off than the vintage ones we have, and we should also note that the overall balance is somewhat different. In fact, the new ones seem less well-balanced than the old pair, whose lows are at almost the same level as the highs. The 2015 model displays a slight skew towards the high end. We then proceeded to listen to some songs we know by heart, starting with Johnny Cash's rendition of "Hurt." The first thing we noticed is that the Avantones are less accurate and well-balanced than the Auratones, and their dynamic response isn't as big. There's obviously no comparison between the two brands and the listening test only confirms what the measurements had shown. 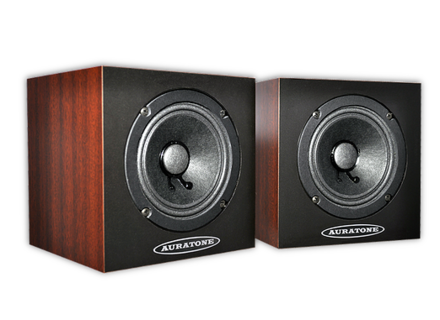 The difference between the two Auratones, in terms of balance, is also noticeable. The new ones are sometimes at the limit of becoming aggressive in the high end, without ever reaching that point though, and the old ones have a better developed low end, much more balanced in relation to the rest of the spectrum. The vocals and guitar seem a bit more natural with the old Auratones. On the Raconteurs' "Consoler of the lonely," the Avantones are completely off mark due to their unreliable mids. Plus they sound less lively than the Auratones, with a somewhat cardboard-like sound. Auratone have played their cards right keeping their competitor at bay, even though they haven't quite reached the level of their own vintage products. The two small bumps in the mids and highs make electric guitars and vocals slightly aggressive, although they don't necessarily provide as many details as the old Auratones. Furthermore, the low end (between 100Hz and 300Hz) is clearly easier to hear and more accurate on the old ones. To finish, we listened to "Liberian Girl" by Michael Jackson, only to confirm our previous observations: the Avantones have a hard time keeping up with the Auratones, and the 2015 model are slightly less accurate than the vintage, especially due to the unbalance between the high and low frequencies. The new Auratones cannot replace our good old 5PSCs which remain more well-balanced across the entire spectrum, but they certainly dwarf the Avantones in every respect. 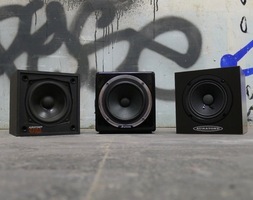 And these differences in performance are clearly reflected in the price of the two speakers, too. It's a pity there's no model with a built-in amp right now, because it would come in really handy sometimes. These 2015 Auratones are a very nice surprise and we couldn't be more excited about their "return." Their price is pretty fair in comparison to the competition, especially considering they are made in the USA. While they lag slightly behind our vintage 5PSCs, they easily outclass the Avantones. To sum it up, they are a pretty safe bet and a good investment if you are looking for a set of speakers to complement the ones you already have. The only thing we could ask from the manufacturer is to introduce an active model. Could we have an active version?